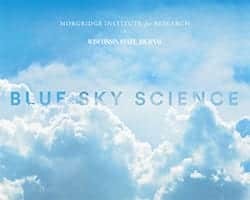 News & Stories > Blue Sky Science > How can we use stem cells to build tissues and organs? How can we use stem cells to build tissues and organs? There are two major properties of a stem cell, and the first one is its potency. By that we mean its ability to give rise to specialized cells. There’s this hierarchy in stem cells depending on how potent they are. At the very top are the pluripotent stem cells which can give rise to everything. The second component to a stem cell is this term called self-renewal. By that we mean the ability of the stem cell to regenerate itself. All of us walk around with stem cells that repopulate our blood and our muscle tissue and our skin tissue. We’re in a constant state of renewal. To get back to the question of “How do we make tissues and organs from stem cells?” The trick is to understand the signals that tell a stem cell how to give rise to all the different cell types within that tissue. You can imagine that that’s a lot of trial and error, because there’s no sort of manual that tells us how to go from a stem cell to particular tissue or how to go from a stem cell to a particular organ. The biggest challenge right now is that we can push a stem cell to a single cell fate or specialized cell state, but in a tissue there’s multiple cells. An organ like your heart or your brain, it’s not just made of one cell type. It’s made of many cell types working together. How we structure an organ to have all that cellular diversity is still largely unknown. Learning how to tweak the system so you get just the right ratios of different cell types that then engage together to form a really functional and useful tissue, I think, will be a key next step. Could we use planarians to help us understand human regeneration? Stem cells: Where are we going? Could we make a living creature using only stem cells?